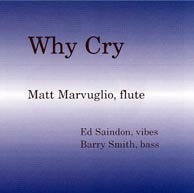 Flautist Matt Marvuglio put out this recording and it features Barry Smith on bass and myself on vibes. Matt, Barry and myself have played quite a bit together over the years. The flute, bass and vibes make for a nice combination. We have played quite a few gigs in addition to some enjoyable concerts in Brazil, Mexico and England where Matt was presenting clinics at Flute Conventions. The material features some standards as well as originals by Matt and I. Matt’s brother, Tony did an excellent job of recording the music. It was a very enjoyable session done in an afternoon. There is no drums on the recording, but with Barry’s exquisite playing, there’s nothing missing in terms of time feel.